married Bridget Dalton Nov. 18, 1854 in Grundy County, IL. Bridget died Aug 8, 1858 in Will County, IL (conflict on date-1860 census taken in June 1860 indicates Bridget living with James and their son David). 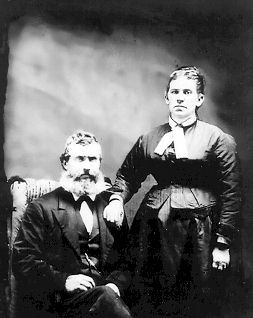 James married Elizabeth Magner Nov. 30, 1862 in Will County, IL. Became a citizen on June 19, 1855 and is buried in St. Isidore cemetery Bethany, IL Parents of James: David and Jane Henneberry. Elizabeth Magner Henneberry: born May 1, 1837 in County Tipperary Ireland; died Aug 27, 1917 in Dalton City. parents of Elizabeth: Father: James Magner Mother: Margaret Fruein. Elizabeth is buried in St. Isidore cemetery in Bethany, IL. Bernard Bresnan, James Henneberry, Agnes Henneberry Bresnan, Emma Henneberry Kinney, Elizabeth Magner, Edward Kinney holding Ray Kinney. 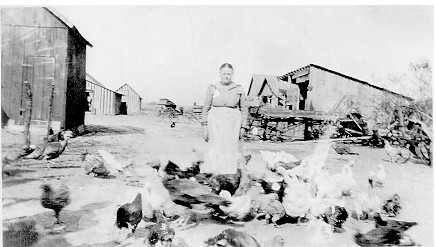 Dalton City Henneberry Farm about 1886. 1850 Illinois Census: Braceville Township, Grundy County. Jane Henebry age 40, Thomas age 20, David age 18, James age 16, Michael age 12, Bess age 14, Elizabeth age 10, Patrick age 9, Bridget age 7. 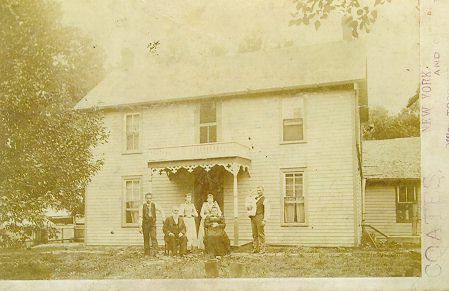 1860 Will County Census: Wilmington Township pages 102-103: Taken June 21, 1860. James Henebery, age 28, Bridget, age 28, David, age 5 and Ann Dalton, age 20. Ann is probably the sister of Bridget Dalton Henebery. Also living with James were his brother, Thomas, age 30, Mary, age 30, David, age 5, Catherine, age 3 and Michael age 3 months. All of the children born in Illinois. 1870 census for Grundy County, IL, Felix Township, page 29. James Henneberry age 36, wife, Elizabeth age 32, and five children: David-age 14, Margaret-age 5, Emma Jane-age 3, and Elizabeth-age 6 months. 1880 census for Moultrie County, IL, Dora Township-Vol. 43, ED 166 sheet 10, line 42. James Henneberry-age 46, Elizabeth-age 42, David-age 23, Maggie-age 15, Emma Jane-age 13, Lizzie-age 9, Teresa-age 6, Mary Agnes-age 3, Ambrose-age 1. 1900 census for Moultrie County, IL, Dora Township-ED 99, sheet 11, line 59. James Henneberry-age 68, Elizabeth-age 63 and Ambrose-age 21. Teresa: died Dec 21, 1889 at age sixteen. From the Bethany Echo: Friday July 31, 1908.
cemetery. A host of friends sympathize with the bereaved family." From the Bethany Echo: Friday August 31, 1917. Solemn high mass was celebrated with Rev. Fa. Joseph Kiely as celebrant, Rev. Fa. J. Magner as deacon and Rev. Fa. Smith as master of ceremonies. Rev. Fa. Kiely and Rev. Fa. Magner are both nephews of Mrs. Henneberry. Music was furnished by the regular choir of the church, with Miss Morrison as accompanist. The flowers were in charge of Misses Louise and Margaret Vollmer, Nina Wehmoff, Marie Foley, Loretta Burns and Louise Henneberry, all nieces of the deceased. The pallbearers were Edward Foley, Ray and Leo Kinney, Thomas Magner, William and Emmett Henneberry, Homer Dunn and Merrill Wehmoff, all nephews of Mrs. Henneberry. The internment was in St. Isidore's Cemetery. Continued confusion regarding spelling of surname. The Moultrie County death certificate for James is spelled Henneberry. The death certificate for Elizabeth is spelled Henebery, and the gravestone is spelled Heneberry. Ship's manifests from the 1840's listed the name as Henebry, Heneberry and Henerbry. The Catholic Church in Bethany is spelled as St. Isadore and as St. Isidore. Ship's clerks, census takers, newspaper reporters and others appear to have used "phonics" to spell names and places. Dates also were subject to errors. Obituaries were also subject to inaccurate descriptions.